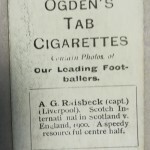 Ogden’s started life in Park Lane in Liverpool as a single tobacconist store, but by 1890 had six warehouses across the UK to make it one of the largest tobacco firms in the UK. 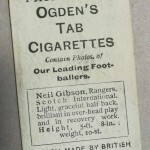 These cards date to around the turn of the 20th century, before Ogden’s started printing colour. 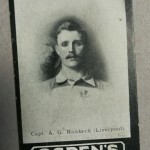 Alex Raisbeck was considered to be Liverpool FC’s first ever star player, staying with the club for 11 years, claiming two league titles as captain before he left in 1909. 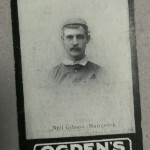 Scottish International Neil Gibson won four consecutive league titles with Rangers, and three Scottish Cups. 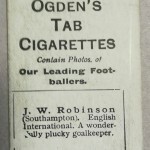 Jack Robinson spent 5 years with Southampton between 1898 and 1903, as The Saints dominated the Southern League. 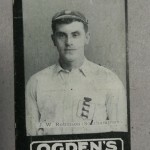 He was instrumental in the club making the 1900 FA Cup final, before a selection row led to infighting between their English and Scottish players, and a heavy defeat by Bury who won 4 – 0. 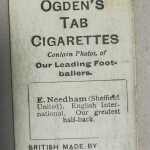 Ernest Needham was a top flight footballer, and also played cricket for Derbyshire. 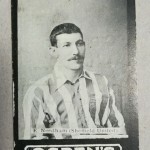 He spent his entire professional career with The Blades from 1891 to 1909. Injuries in his opening season led to a switch from right-to-left wing, and he was greatly admired for his stamina and bravery. He was widely known as “the prince of half-backs” at the time.